Did I ever tell you the story of my allergy appointment? My dreadful allergy appointment with the allergen specialist? It was many years ago. It involved 60 needle pricks to the back and seven (SEVEN) big slow shots to the arm. I was exposed to all sorts of substances and my degree of reaction was measured. I left with a list of foods I needed to avoid and a very heavy heart. Let's just say I'm not quite sure about the credibility of that doctor, or where he is now, but if he reads this blog he'd have a laugh I'm sure. I'm happy to report that chocolate makes a very daily appearance in my diet (so do bananas and yogurt) and I feel nothing but great about it. I'm purely grateful that I can eat anything at any time without question or worry, for the most part, but it's not that easy for everyone. 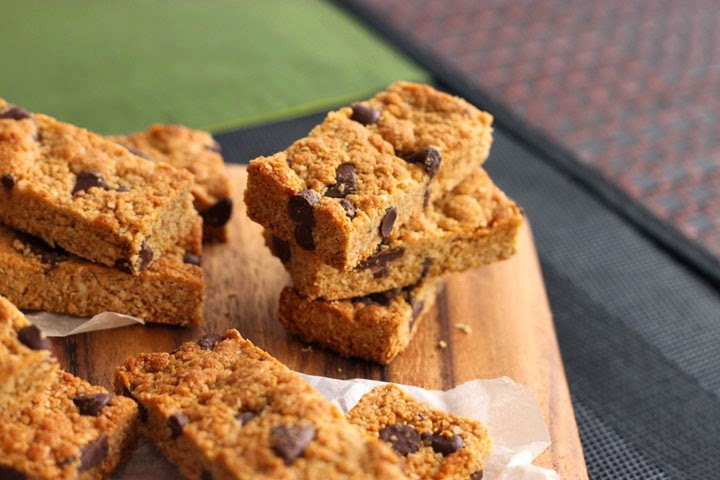 Despite the lack of gluten, dairy or egg, these cookie bars deliver! I love this recipe. I'm a fan of snack bars. 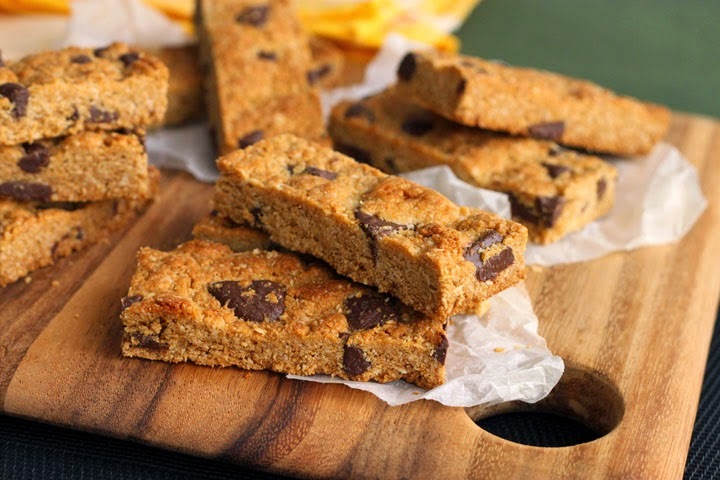 They're quick, portable and they can have as many chocolate chips in them as I want depending on how desserty I want them to be. 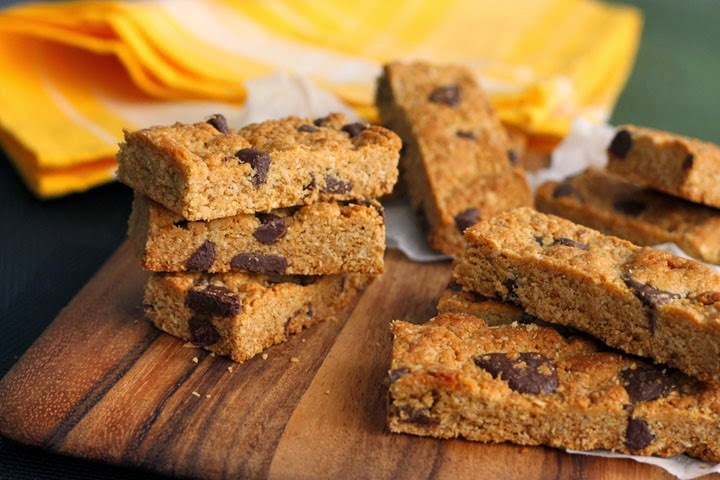 These bars carry the lovely soothing flavours of oats and honey. 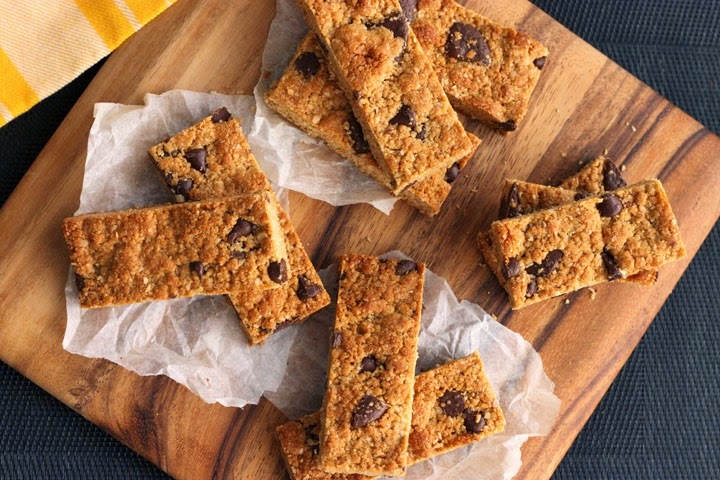 Add to that the perfect combo of coconut and chocolate AND almond, and you get one satisfying stick. They have a soft chewiness reminiscent of chocolate chip cookies. 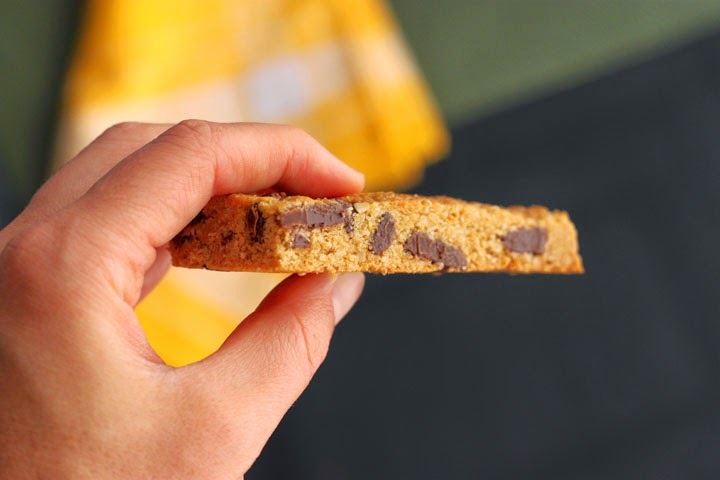 But, imagine those chocolate chip cookies are made with peanut butter. I mean, come on! This is craziness. Too many amazing flavours in one bite. I can't see any fault here. Promise they won't take more than 7 minutes to prepare. You need one bowl, one saucepan, and you could argue the wooden spoon. This is a dream recipe. For me AND for you. We are both happy. Gluten-full or gluten-free, tomato or tom-ah-toe, it's all the same here. If you like food, you will like these. Preheat oven to 350°F. Line an 8x8-inch square baking with parchment paper and set aside. 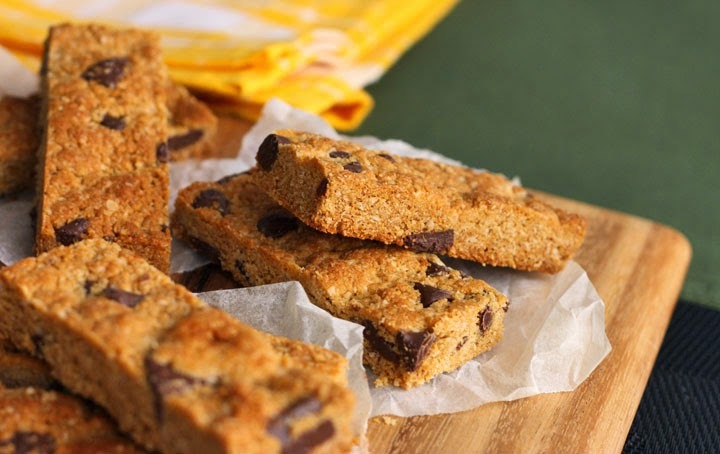 Combine almond meal, ground oats, baking soda, salt and brown sugar in a bowl. Mix well to remove any lumps of sugar. Melt together peanut butter, coconut oil, honey and vanilla over low heat in a saucepan until smooth and combined. Pour over dry ingredients and mix until well blended. The mixture should feel moist but crumbly. 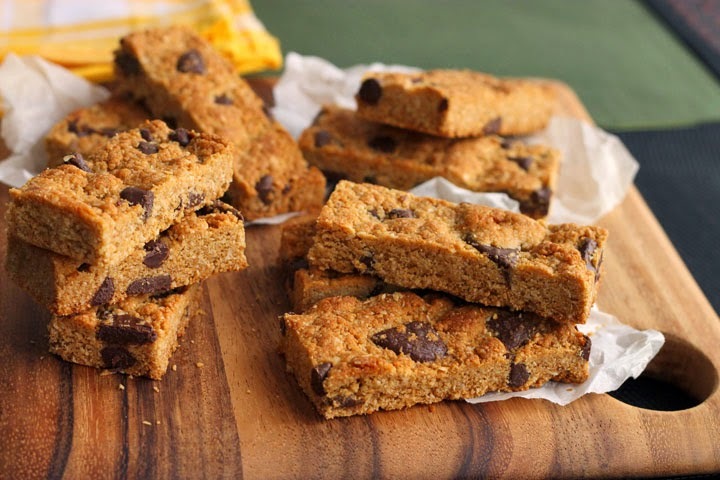 Let it cool down if it is still warm from the peanut butter mixture before tossing through the chocolate chips. Dump mixture out into prepared pan and press it out firmly and evenly. Bake for 13-15 minutes, until evenly golden brown on top. Let cool completely in pan before slicing into bars. These look incredible! Definitely making them this week!! My uncle cannot eat anything with eggs in it, so truly thankful for this recipe. There are a lot of people out there who need this type of egg free and gluten free tasty recipe so thanks!